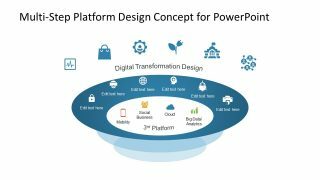 The Multi-Step Digital Transformation Platform Design for PowerPoint is a business presentation of IT integration. 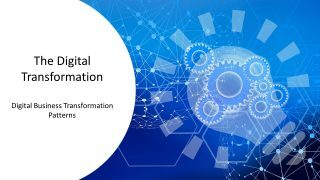 The digital transformation for organizational activities, processes, and models means, taking full advantage of opportunities provided by digital technology. 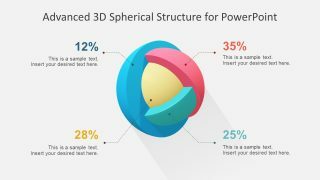 The multi-step PowerPoint visually illustrates all three DX(digital transformation) level while focusing on 3rd platform. Therefore, this template can assist in demonstrate history of transformations from platform 1-3 for educational purposes. The users can explain an evolution of digital transformation affecting the businesses and everyday life with attention to customer experience. Following are the brief descriptions of all three platforms. 1st Platform: The beginning of technology, when mainframes and terminals were introduced. 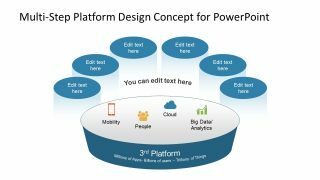 2nd platform: It began with the emerging PC computers and Client/server model, Ethernet, and digital business applications. 3rd Platform: The cloud, social and other big data technologies are the foundation of this new platform. The organizations need to analyze the impact of technologies and how to engage with customers. 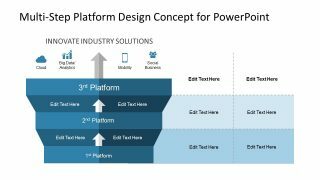 For this purpose, the 3rd platform provides solution development and business innovation. 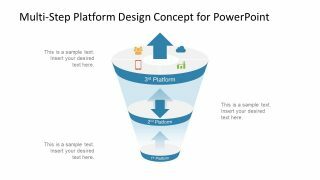 The Multi-Step Digital Transformation Platform Design for PowerPoint contains 4 slides. 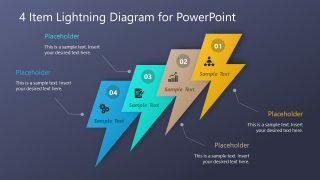 While there are two slides of funnel diagram design with all three platform levels. 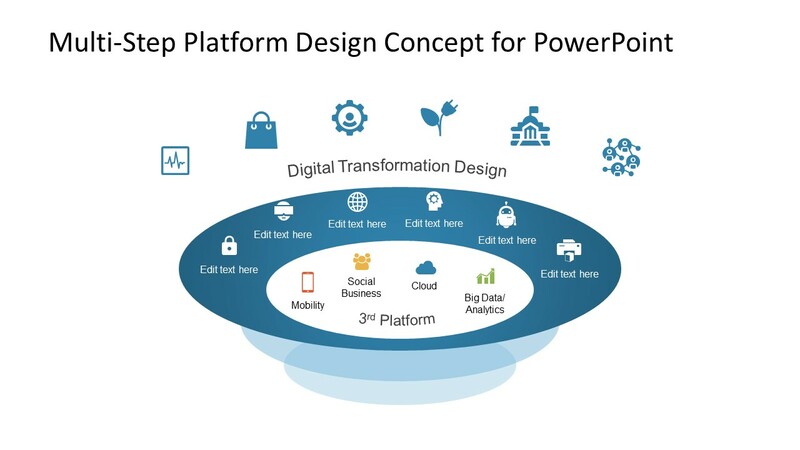 And, two more slides giving a top-down view of latest digital transformation platform. These slides also provide clipart icons as graphic representation of technologies. 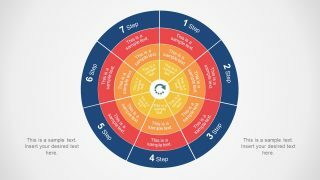 Rapid change: creating value at much faster pace. Expanding use cases: For technologies built in 2nd platform, expand their use cases and value. Data Service: By using data between application, Data as a Service (DaaS) is a new way to utilize and monetize information. The digital transformation also refers to a fundamental change in business operations to deliver value to customers. One of the biggest examples of digital transformation could be the New York Times magazine. They implemented the digital subscription model rather than relying on online ads.